Banks was a highly accomplished London genre painter working at the height of the Victorian era. 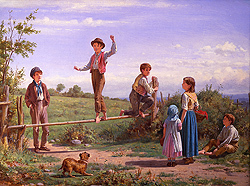 Like his contemporary artists Frederick Daniel Hardy, Charles Sillem Lidderdale, Alfred Rankley and William Bromley, Banks specialized in tightly done paintings often centered on children in playful or amusing situations. While little is known about Bank’s education, it would not be surprising to learn that he, in fact, attended the Royal Academy Schools for his instruction. Banks, while living at 1 Georgina Terrace, exhibited his first work at the Royal Academy in 1856 – Little Nell – and in total, exhibited only 4 works there – Beg, sir! 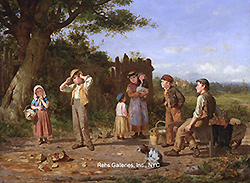 (1857); A Winter Day’s Recreation (1872) and The Broker Jar (1873). He also exhibited 1 work at the British Institution in 1857 entitled The Mountain Girl and exhibited his painting A Visit to the Cottage at the Royal Society of British Artists that same year.